Admiral A.V. Kolchak placed high emphasis on development of the Northern Sea Route. Active sea route from Arkhangelsk to the estuary of the Ob River and the Yenisei River allowed solving two important strategic tasks for the White Army: to establish secure connection between northern and eastern battle-fronts and to provide Kolchak’s Army with the arms, ammunition and other arming coming from England and France, and on the way back to take goods produced by Siberian cooperative societies including, first of all, foodstuffs for Arkhangelsk. On the 21st of May 1919 Provisional Government of the Northern region adopted a resolution “On Founding of Inter-Departmental Commission for Marine Expedition to Siberia”. Bolsheviks also recognized the necessity of northern seaways development. On the 2nd of July 1918 Lenin signed a resolution of the Council of People’s Commissars on allocation of one million roubles for development of the Arctic Ocean. On the 10th of March 1921 Lenin signed a decree on creation of Floating Sea Research Institute to study the Arctic Ocean with its seas and river estuaries, islands and the Arctic coasts of RSFSR. From 1923 nineteen radio meteorology stations were built within 10 years. The notion “Northern Sea Route” completely displaced the previous name “North Eastern passageway” in scientific and everyday use. The expedition of O. Shmidt on steam icebreaker “Alexander Sibiryakov” in 1932 was the starting point for opening regular traffic along the Northern Sea Route. In 1929 Otto Shmidt, a prominent scientist and editor-in-chief of Big Soviet Encyclopaedia, was appointed the chief of expedition to the Franz Josef Land. The aim of the expedition was to secure USSR sovereignty in this territory. This expedition as well as several subsequent polar expeditions on “Sedov” icebreaker allowed O. Shmidt to evaluate the meaning of polar investigations and navigation possibilities in those latitudes. In 1932 the first expedition on steamship “Sibiryakov” under direction of O. Shmidt and captain V. Voronin managed to go over the Northern Sea Route within one navigation season. The steamship “Sibiryakov” with displacement of 3200 tons put to sea from Arkhangelsk on the 28th of July 1932 and reached port Dickson on the 3rd of August 1932. On the 11th of August the ship refilled coal reserves and continued to the Severnaya Zemlya Island through the Sidorov Island. Then “Sibiryakov” passed from the Kara Sea to the Laptev Sea and reached the Tiksi Bay. 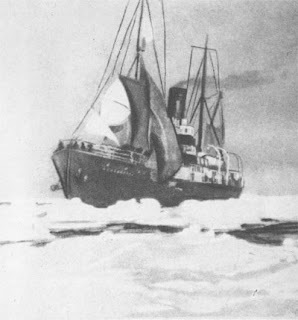 Near the Chaun Bay the expedition was blocked by pack ice. Passing slowly the ship reached the Kolyuchin Island on the 10th of September. In harsh ice conditions the four propeller blades of “Sibiryakov” were broken down. Blades replacement took six days. The crew continued in the direction of the Bering Strait, but in two days the blade roller was cut off by a block of ice. For ten days the ship drifted in different directions. As soon as the ice conditions improved 11 sails were set. Slowly the ship reached the northern passage to the Bering Strait. Thus the way from the estuary of the Northern Dvina to the Bering Strait took two months and three days. “Usuriets” trawler towed “Sibiryakov” to Petropavlovsk and then to Yokohama for repairs. The ship returned to Arkhangelsk passing by the Suez Canal. (Studies on history of geographical discoveries, 1986, p. 46-47). Successful expedition of Otto Shmidt proved the possibility of active development of the Arctic. GLAVSEVMORPUT (Northern Sea Route General Office) was established to put the idea of Arctic development to practice. Otto Shmidt was appointed the Chief of GLAVSEVMORPUT. The principal goals of this organisation included Northern Sea Route developing and fitting with technical means, studying of subsurface reserves in polar territories and starting research studies on regular basis. The scope of activity included construction of weather stations along the coast, development of radio communication and polar aviation, construction of icebreakers and ships for navigation in Arctic conditions. In order to check navigation possibilities for carriers in the Arctic Ocean in 1933 the steamship “Chelyuskin” followed the route of the steamship “Sibiryakov”. O. Shmidt and V. Voronin headed the crew of researchers in different fields of knowledge. There was a group of winterers with families on board the ship. The winterers and carpenters were supposed to disembark on the Wrangel Island. In harsh conditions “Chelyuskin” reached the Bering Strait but the ship did not manage to pass through to the Pacific Ocean due to wind and current. It was inevitable to stay for the winter. On the 13th of February 1934 ice broke the shipboard and within two hours the ship sank. 104 people including 10 women and 2 children with emergency supplies found themselves on a block of ice. The stay of Chelyuskin team in a camp and rescue by pilots is known in the world as heroical deed of Soviet explorers of the Arctic. In 1934 the ice-cutter “Litke” made the voyage from Vladivostok to Murmansk without failure by the Northern Sea Route. “Litke” captain was N.M. Nikolaev, research manager V.Yu. Vize. In 1935 four cargo motor ships passed through the Route during a single navigation season. In 1936 warships of the Baltic Fleet successfully arrived to the Far East, and in 1939 “Stalin” icebreaker made a double trip within one navigation period. 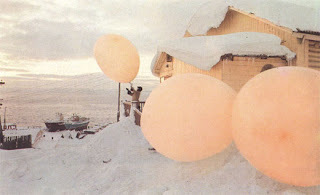 The Soviet Union was the first and the only country actively using drift-ice research stations. Such stations represented a number of houses equipped for habitation and research. 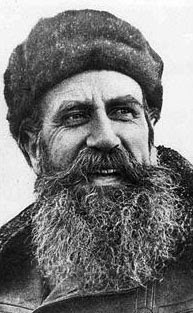 The idea of drift-ice research stations belonged to Vladimir Vize, a researcher of Scientific Research Institute of the Arctic and the Antarctic. This was an efficient and low-cost research solution proposed in 1929. Thanks to drift-ice stations it was possible to study the Arctic all the year round. In spring 1937 the team of the first drift-ice research station arrived on site. Members of the first team were I.D. Papanin (the Chief), E.T. Krenkel (radio operator), E.K. Fedorov (geophysicist) and P.P. Shirshov (oceanographer). During 274 days “North Pole” station made 2050 kilometres. In February 1938 the icebreakers “Taimyr” and “Murman” evacuated the station. Before the Great Patriotic War the Soviet Union gained big experience of carriers navigation in the Arctic. The ports of Dickson, Dudinka, Tiksi, Pevek and Provideniya were under construction. During the war apart from supply of the Arctic construction sites and research stations it was necessary to ensure supply of garrisons and warships and to receive goods delivered from the USA and Canada. The most outstanding voyages along the Northern Sea Route in the 1940-1970’s included transportation of manufactured products and foodstuffs from the Pacific coast of Yakutia and the eastern part of the Soviet Arctic, delivery of warships from the Far East to the Barents Sea during the Great Patriotic War, navigation of river boats from European ports to Siberian rivers (from 1948), navigation of fishing boats to the Far East (from 1951), double cargo voyages of diesel-powered motor ships “Lena” and “Yenisei” (from 1954) and autumn voyages of atomic-powered vessel “Lenin” (1970-71). The Northern Sea Route is an integral part of the economy. It is vital for the regions of the Extreme North and the Far East. It ensures supply of remote areas with fuel, foodstuffs and essential goods and supply of the continent with natural resources. Dissolution of the Soviet Union followed by social and economic crisis of the post-Soviet space in the early 1990’s had a negative influence upon the condition of the Northern Sea Route. The supply system was destroyed due to dissolution of centralized maintenance supply of the Russian North. Due to price liberalization and credit system reconstruction most enterprises in the framework of the Northern Sea Route operation were in a difficult financial state. In the first place it concerned icebreakers and other ships of the Arctic fleet, ports, polar research stations and some settlements whose economy developed around servicing the Northern Sea Route. By 2003 the volume of freight decreased 5 times (1,7 million tons) in comparison with the golden age of the Soviet era. At that time the biggest freight volume belonged to “Norilsk Nickel” company (up to 65%). At present practical steps are made in Russia to overcome the crisis and to continue development of the Northern Sea Route. This proves high strategic significance of this unique Arctic itinerary. In the first place this high importance is connected with forthcoming development of immense Arctic offshore oil and gas fields. Transit functions of the Northern Sea Route are also of high importance, mainly for development of regions located in the Extreme North and the Far East. Nowadays, many countries of the world are interested in cargo transportation by the Northern Sea Route. This is mainly due to the growing commodity turnover between Europe and the countries of Asian and Pacific regions. Possibly the XXIst century may become an era of intensive development of the Northern Sea Route as of an important arctic transportation passage of national and international importance. Did you know that you can shorten your urls with Shortest and get money from every click on your short links.